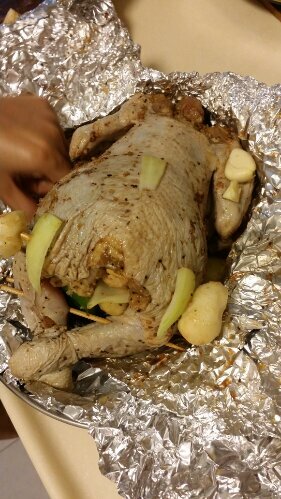 Christmas Roasting – Beer Spa Chicky Chicks! 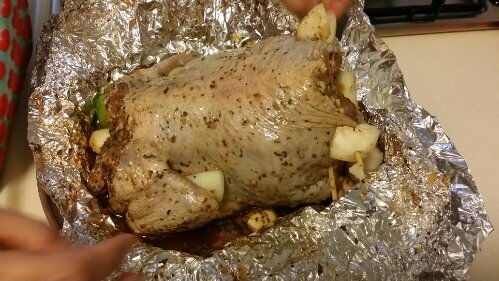 6 Comments on Christmas Roasting – Beer Spa Chicky Chicks! Christmas is the perfect time for feasting! This yuletide was a little different (personal matters aside) as we finally put our oven to good use after a hiatus! Besides some simple meals for baby V, our good ol’ Ariston oven basically under declares its prowess by disguising as a toaster on most days. Hubs and I used to cook together – not very often but definitely more often than present. So the hubs decided that we should do a roast chicken when the family comes over for dinner. Special thanks to our friend, XH, for the tips and recipe! He made tenderlicious ones during one of our gatherings, so we still have room for improvement after our first attempt. 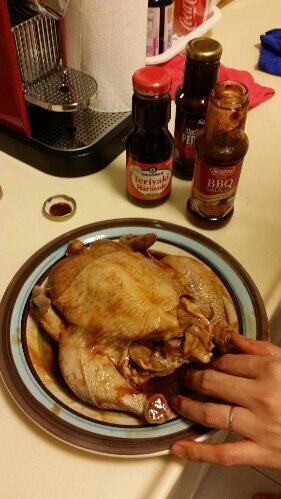 The Beer Chicken recipe is surprisingly easy and versatile. Like most other food that we usually make for baby V, these are probably the 2 key selling points that get me. Time-strapped parents, true that! Oh, and this roasted chicken recipe includes alcohol, so we wouldn’t recommend offering to very young children, unless of course, you’re bent on early introduction. HA! ~ depends entirely on your preference! But here’s what we used. *Servings were mostly guesstimations and let’s just say we kinda overbought some stuff since these items usually come in a standard pack. The upside? These ingredients are great for other meals the next few days too, so no wastage! 1) Use a fork to poke all over chickens to create little holes on meat for better absorption. 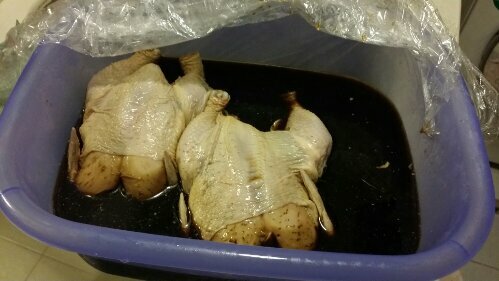 (Note: May seem like you’re stabbing them.. that was how the hubs felt…) Soak chickens in bath of beer for 48hours. Try to ensure maximum submersion. Otherwise, turn chicken after 24hours. 2) After 48hours, remove chickens from beer spa. Prepare marinade and gently massage marination into meat. Wrap with aluminium foil and place in dry container and store in fridge overnight. 4) Preheat oven for 15minutes at 180degrees and set to “Roast” function. 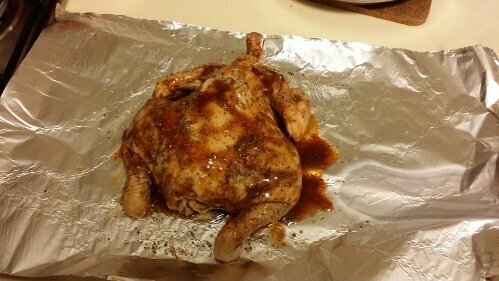 To roast, lay chickens on grill at mid oven with dripping tray below. Set timer for 20minutes. At 10 minutes, recoating marinades with butter for each chicken to keep them moist. If you wish to, put potatoes or other veggies on dripping tray (nearer door; away from chickens if you’re worried about the oils) to roast together. Note that potatoes tend to take awhile to cook so do check on them before serving. Marinades can include herbs such as rosemary, thyme, chilli powder etc. so it’s really about preferences. Ingredients are entirely up to you as well! We used veggies to balance the dish and make it more wholesome. Oven settings may defer, so do check on your meat intermittently to prevent charred meat. 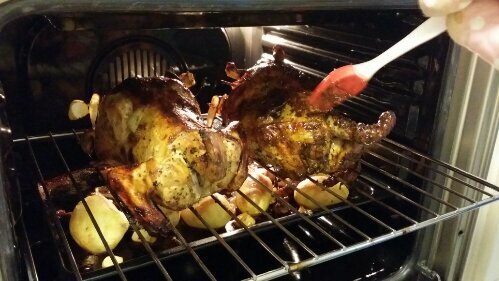 Be very careful when re-coating when the chicken is roasted as the heat will gush out when the oven door is opened. Grills and dripping trays are scalding hot too, so do put on kitchen gloves! TA-DA! Serve beer chicken freshly roasted and hot from the oven for best flavours. Grab some wine or beer and enjoy your feast! Have a belly good time! Previous Entry 13 Party Planning Tips – For the Big One!